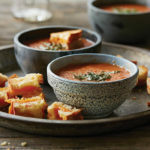 The ultimate comfort meal—tomato soup with grilled cheese (croutons) on top. Obviously it is best to make this soup in the summer and fall, when fresh garden tomatoes are available, but there are some “acceptable” winter-tomato substitutes such as good-quality organic canned tomatoes or hothouse-grown organic winter tomatoes. Add 1/2 teaspoon sugar with the tomatoes if you are preparing this soup in winter. The Grilled-Cheese Croutons will appeal to kids as well as grown-ups. 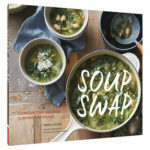 ON-DEMAND: Listen to Faith, Chris Prosperi, and Kathy talk about this comforting soup (which Chris made for our pre-show meal), as well as how to start a soup swap of your own. 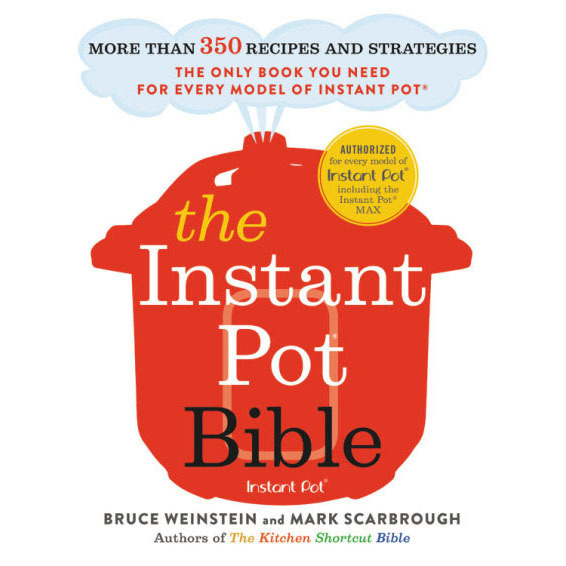 Please support The Faith Middleton Food Schmooze® and all of WNPR’s programming by swapping a pledge of $8 a month for this book. Make your pledge now. Thanks. Trim off the dark green sections from the leeks and save for making vegetable stock. Halve the pale green and white sections lengthwise. Rinse under cold running water, pat dry, and cut crosswise into thin pieces. TO GO: Prepare the croutons but instead of adding the basil and cheese and broiling them, place them on a baking sheet and cover with plastic wrap. Pack the basil and cheese separately. At the party, broil the croutons with the cheese and sprinkle with the basil just before serving with the soup. Can be served cold, vegan. Question: If using canned tomatoes, what size can(s) and how much? 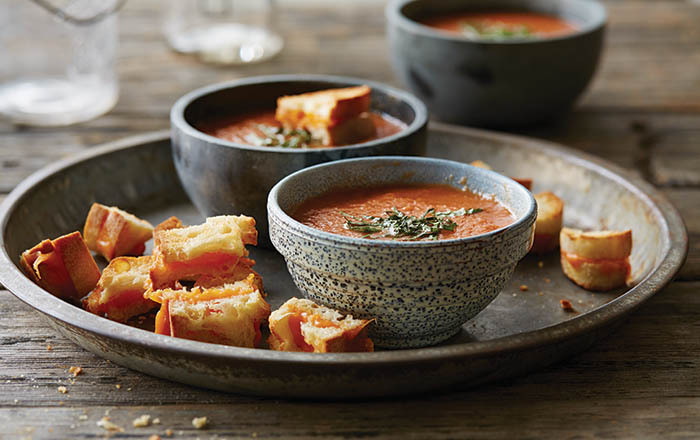 Sounds delicious…always looking for a comforting tomato soup/grilled cheese combo! Thank you! Hi Patty: I’d probably use the same weight measurement for the canned tomatoes as fresh, so 2 lbs. total of canned tomatoes. The Red Pack tomatoes I buy come in a 1 lb. 12 oz. can, so I’d use about 1-1/4 cans (give or take). I love throwing canned tomatoes in things like pasta, eggs, or rice, so I consider having some of that second can leftover a bonus. There’s lots of liquid in a can of tomatoes, too, so I might use some of it to make the soup extra tomato-y and cut back a bit on the amount of vegetable stock. I think you just gave me some ideas for my weekend cooking. . .thanks! Have been wondering for quite some time if this Kathy Gunst worked, at once time, at Middlesex Community College in Middletown CT. Just a wild shot! She didn’t mention any CT connection when we talked to her. We still love her, though, even if she is 100% a Mainer.